Carefully crafted & nutritionally balanced complete dry dog food for the health and wellbeing of small breed adult dogs from 6 months to 10 years with an adult weight of 10 kg and under that enjoy a grain free diet. Using all our knowledge and experience, we’ve created James Wellbeloved Fish Grain Free Small Breed Adult. We take a handful of ingredients from nature, a single animal protein, combine them with vitamins and minerals and plant extracts into a smaller kibble that’s specially formulated for your small adult dog. 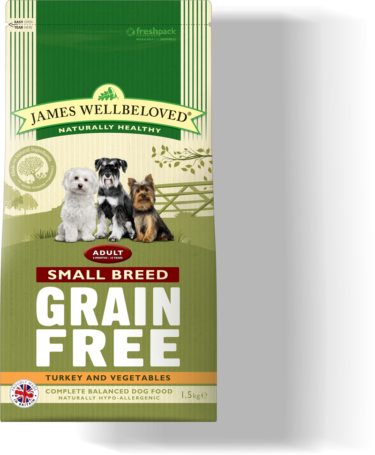 For added peace of mind, it’s naturally hypoallergenic so less likely to cause an adverse food reaction and you will never see any added artificial colours, flavours or preservatives. Not now, not ever. My dog loves it BUT I don't like the smell. This is a good well balanced food which my dog loves.